a good passionate fit of crying. This is a tricky review to write. Partly because I don’t tend to enjoy writing negative reviews (I wrote a whole post on the topic, including why I think they’re useful, here). Mostly though because Wuthering Heights is widely agreed to be a stone-cold classic and is a book that a great many people absolutely love. I wanted to love it too. Unfortunately, I didn’t even think it worth finishing. 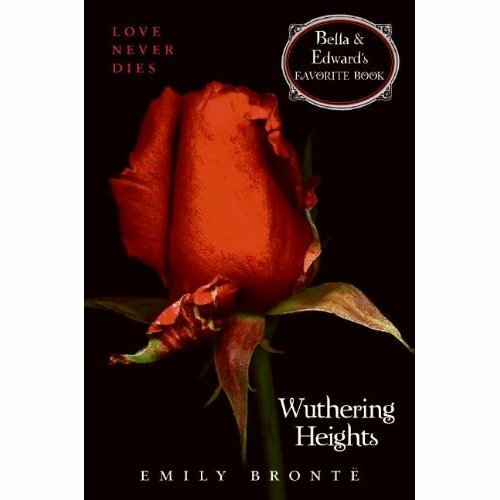 As an aside, when I first saw that cover I thought it shameful that Wuthering Heights was being sold by reference to Twilight. Having now read a fair chunk of the book though, I can sort of see the link. As the above quote suggests, we’re in gothic novel territory here. Remote, brooding locations. Stormy metaphoric weather. Strange households with dark secrets best not spoken of. To be fair, these are a few of my favourite things so I’ve no issue with any of that. I’d even go so far as to say that the opening sets up expectations nicely, making it clear that what’s to come isn’t going to be a matter of strict realism but rather a work of mood and emotion. Where the book soon runs into difficulty however is a flabbiness of structure. It opens with a framing device, the remarkably irritating initial narrator coming to his new landlord’s home and discovering a household afflicted by the remnants of past misery and bitterness. Edith Wharton, nearly 70 years later, used much the same device (quite possibly influenced by Brontë) in her Ethan Frome, but Wharton is a much better writer. Her narrator doesn’t take over the tale, she gets to the actual story much more swiftly and her prose is vastly more elegant. Wuthering Heights then cuts back to the childhood of the central characters (one could argue who those are to a degree, but however you cut it they include Heathcliff and Catherine Earnshaw). Heathcliff is a foundling, adopted by Catherine’s father and raised with her, not quite one of the family but not a servant either. He cuts across barriers of class, money, race and propriety. In a sense he’s almost more plot device than character, an interloper from beyond the social world the novel otherwise portrays, and thus a living challenge to that world’s order. He is a dark-skinned gipsy in aspect, in dress and manners a gentleman: that is, as much a gentleman as many a country squire: rather slovenly, perhaps, yet not looking amiss with his negligence, because he has an erect and handsome figure; and rather morose. Catherine, though as wild as Heathcliff by nature as a child, grows up to assume the place expected for her by society. She becomes a lady, gently spoken, refined and beautiful. In her heart she loves Heathcliff, but when the time comes for marriage she chooses a gently born neighbour as Heathcliff has no fortune and thus could not maintain her position. I won’t say what happens, since there may be those reading this who don’t actually know the story, but it’s all very passionate and dramatic. How could it not be, when we have conflicts of nature and society, of expectation and desire? The problem though is the characters and the contrived nature of the plot. A degree of contrivance is inevitable in a gothic novel. Here though it’s simply heavy handed. At one critical passage Heathcliff overhears Catherine talking about how she feels about him. He manages to hear the bit about why she doesn’t want to marry him (he’s broke), but not the lengthy exposition of how much she loves him. He then charges off in a fury and naturally never thinks to ask for clarification. It’s a device still used in literature and film today, the part heard conversation leading to misunderstanding and breakup, but it’s a terrible device and the perfect example of how characters here act as puppets to the plot rather than from any organic sense of character. Wuthering Heights is a novel of grand passions. The difficulty is that the characters are vehicles, not people. It’s easy to write that two characters love each other. I can do it now: Bill and Hannah love each other. It doesn’t make it mean anything though. Bill and Hannah are in love because I’ve said they are, but I’ve established nothing about them that makes that love meaningful. Reading Ethan Frome, I could see why Ethan felt trapped, why his cousin Mattie was so important to him. The characters felt real, their emotions grew out of their natures and their situations in ways that were organic and true. Ethan Frome isn’t really any less contrived than Wuthering Heights, but it feels like a story that could be told in no other way and so has the quality of Greek tragedy. In Wuthering Heights characters act as the plot demands. Of course that’s also true of Ethan Frome, and most every other plot-heavy novel ever written, but in Wuthering Heights you can see the puppeteer’s hands moving the strings. I had no sense that Heathcliff and Catherine’s situation arose out of anything other than their being written to be in that situation. I had no sense that they had lives beyond the novel (which of course no character in any novel does, but then novels are beautiful lies which in most cases at least seek to make us forget we’re being lied to while we read them). Perhaps I was just the wrong age for this book. Were I first encountering it as an adolescent I can see that I might relate to characters motivated by sweeps of emotion which overcome their reason. I might find Heathcliff romantic (with a lower case r, he’s obviously Romantic with an upper case R), and Catherine’s dilemma interesting. I’m not adolescent though, and I couldn’t believe in them or their problems. I’ll end on a minor positive note. The following passage reminded me irresistibly of Thomas Hardy’s Under the Greenwood Tree. The two books have nothing in common, and the Hardy while I think more successful is much less ambitious than Wuthering Heights, but the Hardy is easy to love and anything that reminds me of it is welcome. our pleasure was increased by the arrival of the Gimmerton band, mustering fifteen strong: a trumpet, a trombone, clarionets, bassoons, French horns, and a bass viol, besides singers. They go the rounds of all the respectable houses, and receive contributions every Christmas, and we esteemed it a first-rate treat to hear them. There it is then, Wuthering Heights. I genuinely wanted to like it, and having compared it here so much to Ethan Frome which uses very similar devices I’m slightly frustrated that all I seem to say in the end is that I didn’t like it because I didn’t think it was very good. Unfortunately, that’s where I come out, I just didn’t think it was very well written. If you read this and you disagree, think I’ve utterly missed the point, whatever, please feel free to tell me where I went wrong in the comments.